What kind of mixer is a portable mixer? It is a type of mixer that can mix by attaching the main unit of the mixer to the upper edge of a mixing tank or a stand, etc. by clamping (vise). What kind of mixer is a Multi A mixer? It is a type of mixer where the main unit of the mixer is fixed to the top of the mixing tank (flange mounting). A seal mechanism such as gland packing can be provided in the shaft penetrating part. Is there a smaller mixer? There is an EG mixer which uses a 60 W motor. Can you change the dimensions of the shaft and impeller? Please contact our sales staff. The shaft dimensions can be changed up to the “B-MAX (Option)” dimension which is indicated in the catalog. Is there an inverter specification? Yes. Please contact our sales staff. “I” at the end of the model represents “Inverter compliant”. There is also a portable mixer A720-□BX, which is made up of an integrated inverter and main unit. Is there an explosion-proof type? Yes. The “Increased Safety Explosion-Proof Type” and “Pressure-Resistant Explosion-Proof Type” are available, so please specify the type you require. What kind of mixer is a PSE compliant mixer? It is a mixer with “S” attached at the end of model. PSE mark indication for electrical goods is mandated according to the Electrical Appliances and Materials Safety Act enforced on April 1, 2001. In accordance with the Act, we include overload protection devices, switches and power cords with the products, and manufacture and sell them with the PSE mark attached. For details, please see the options on the website or the “Portable Mixer, A Series” catalog. What is the material for the shaft and impeller of the Portable Mixer and Multi A Mixer? Do you sell stands and tanks that are compatible with the mixers? Yes. There are suitable mixers for the stands and tanks. Please confirm in the catalog or contact our sales staff. Can I just purchase parts? We only sell parts to customers who are using Satake products. (Note: Please be aware that we do not supply parts for the EG mixer.) 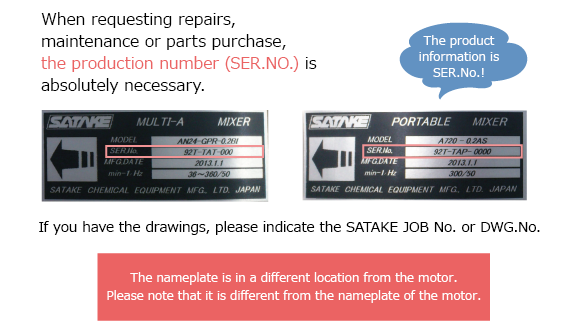 If you are not using a Satake mixer, please understand that it is not possible to purchase parts only, because it is outside the scope of the warranty. If you are not using a Satake mixer, we can not guarantee safety, so please understand that we do not allow attachment of a Satake impeller to another company’s mixer. From where do you ship the Portable Mixer and Multi A Mixer? They are shipped from the Tokyo factory in Toda City, Saitama. Do you have stock of the Portable Mixer or Multi A Mixer? All Satake’s mixers are made to order. We do not have stock. Thank you for your understanding. Can you use the Portable Mixer while holding it by hand? A large rotational force occurs momentarily at startup, so it is very dangerous and the Portable Mixer cannot be used in this way. Please be aware that we do not offer hand mixers that can be held manually. Can the mixer be operated idle or passing through the liquid level? Neither the Portable Mixer nor the Multi A Mixer can be operated idle or passing through the liquid level. It is absolutely not permitted to do so because the shaft will vibrate, etc. and cause damage to the device. Can I install a non-standard impeller? It is possible, but only limited impellers are allowed. Please contact our sales staff. Can I mount two-stage impellers? The range of mixing capacity and viscosity graphs described in the catalog is possible with one stage. Adjustment of the blade diameter is required when specially preparing a two-stage impeller. Please contact us.